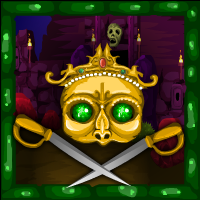 G4E Devil Worship Fort Escape is another point & click escape game developed by Games4Escape. In this game, you have entered a fort, but unfortunately the door got closed. You must find the key to escape from there with the help of useful objects to interact with and by solving puzzles. Good luck and have fun! Hi!I had no problem with the skulls at the begining. Warning ! Warning ! - BUGGED !!!!! doesn't work in edge either, can't place last skull. Skulls worked OK for me, didn't place any until I had all 4. Had 4 sculls, but could only place 3: I'm had to quit. (played on Firefox 61.0.1 (64-bit).